Starting from 1st January 2019, Foreigners buying property in Perth will face an extra 7% Surcharge. Which means you have LESS THAN 8 WEEKS to avoid this surcharge. Western Australia’s State Government have implemented the Foreign Buyers Duty, which will impose additional taxes on foreigners’ purchase of residential property. If you are a foreign buyer, you can save up to $50,000 AUD on stamp duty if you buy before 1st January 2019. Perth’s property market has finally bottomed out and is showing many signs of recovery. So it’s the perfect time to buy a property in Perth before it’s next growth cycle kicks in. 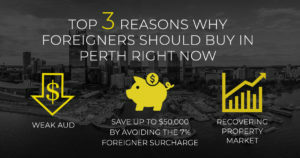 This is your FINAL chance to buy in Perth while these benefits are in your favour. Don’t wait any longer as the clock is ticking. Speak to us today as we would love to help with your foreign property purchase!